Antonio Cruz of Archbold tries to break away from the Swanton defense. He scored an early touchdown for the Streaks. Archbold’s Brandon Taylor is tackled by Kodi Jones of Swanton on Friday. 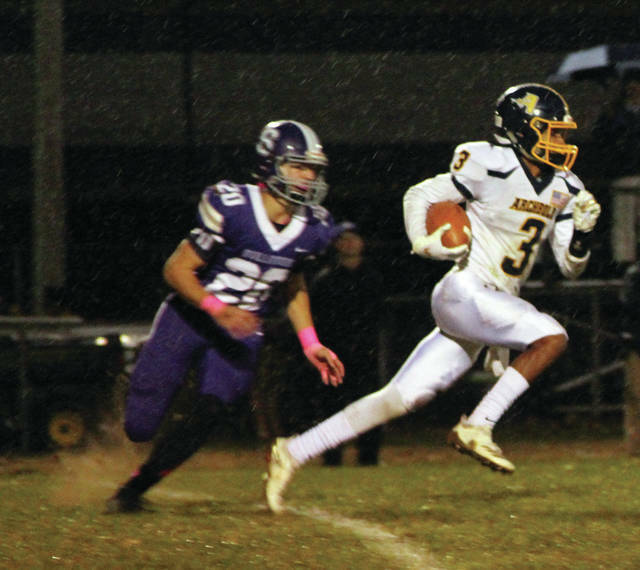 An opportunistic defense put Swanton ahead in the first half, but Archbold pulled away in the second for a 35-13 Northwest Ohio Athletic League victory at a wet Hansbarger Stadium Friday. A long kick return by Elijah Zimmerman set the Bluestreaks up for the first score of the game. Antonio Cruz eventually punched it in from 6 yards out for an early 7-0 lead. Swanton would then march into Archbold territory before the drive stalled, giving the ball back to the Streaks. But, a snap over quarterback Brandon Taylor’s head would eventually be recovered by the Bulldogs, setting them up at the Archbold 16 yard line. The Archbold defense held, but Riley Hensley nailed a 32-yard field goal to put Swanton on the board. The Streaks looked like they would extend their lead, but Dylan Gilsdorf picked off Taylor in the end zone to keep it a four point game. A short Swanton punt set Archbold up with great field position and it looked again like they may extend their lead. However, Gilsdorf scooped up a fumble and raced 85 yards to pay dirt. Hensley’s extra point gave Swanton a 10-7 lead with 8:46 left in the first half. The Bulldogs recovered a fumble on the ensuing kickoff, setting up another Hensley field goal and pushing the Swanton advantage to 13-7 with 4:24 left in the half. Archbold responded late in the half. They drove down the field, drawing Swanton offside on a fourth and one before Taylor punched it in from a yard out with 18 seconds before halftime. The extra point by Zimmerman put the Streaks ahead 14-13. Swanton fumbled the ensuing kickoff but the Streaks were unable to add to their lead before half. Archbold did a better job of hanging onto the ball in the second half and eventually wore down the Bulldogs. Caleb Hogrefe capped a 59-yard drive with a 1 yard run to give the Bluestreaks a 21-13 advantage with 2:15 left in the third. Noah Gomez started the scoring in the fourth with a 4-yard touchdown run to push the lead to 28-13. A Swanton fumble led to another Gomez score, this time from 25 yards out, to cap the scoring for the game with 3:48 left. Archbold had a 306-39 total yardage advantage over Swanton, who was again without last year’s NWOAL scoring leader Michael Lawniczak. Both teams had trouble hanging onto the ball. 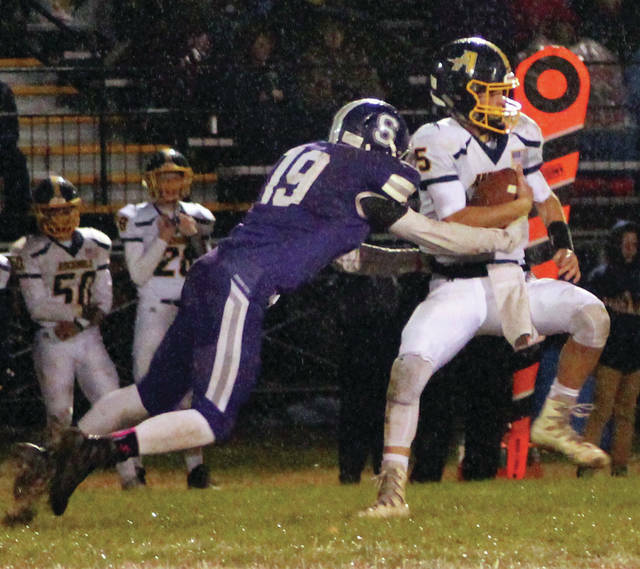 On the night, Swanton fumbled five times, losing two, and Archbold fumbled three times, losing all three. Each squad also threw an interception. The Bulldogs’ injury riddled season came to a close with an overall record of 3-7 and a 1-6 mark in league play. Archbold finished 7-3 overall and 4-3 in the NWOAL, coming two spots short of a berth in the Division V playoffs.